New songs from this critically acclaimed Nashville tunesmith and Kerrville New Folk winner..
Mark’s acoustic roots run deep. As a teenager, Mark immersed himself in the vibrant bluegrass and folk music scene in Washington, D.C. One of his earliest guitar teachers and mentors was Phil Rosenthal, from the famed bluegrass band, The Seldom Scene. A debut album (Common Ground 1988) and a last minute opening act for Tom Paxton lit the fire of the young writer, leading him to Nashville and a publishing deal with Cherry Lane Music. Mark has gone on to staff writing positions with major publishing companies including, Bluewater Music Group, Maypop Music Group (owned by the super-group Alabama) as well as Sony Music Publishing. Mark’s songs have been recorded by independent and major artists, receiving airplay on radio and TV in the United States and abroad. His songs have hit the Billboard Top Forty charts, highlighted by the hit single by Neal McCoy, “Every Man for Himself.” Billboard Magazine called it “a song with rare lyrical and musical edge and the best cut on the album”. Buoyed by wins in singer-songwriter contests at major festivals across the country, Mark began to build a reputation for standout live performances. However, it was winning the Kerrville New Folk Award in 1993 that really put Mark on the map and on the road. As one-half of the duo Culley & Elliott, Mark toured extensively in support of their acclaimed CD, “Flight of Dreams” (1993). With experience and perspective that only time and miles can bring, Mark’s 2004 release, “American Road,” captures the characters, towns and stories from his well-traveled past. “American Road” attracted vocal collaborations from luminaries Don Henry (Grammy Award-wining songwriter) and Jonell Mosser (renowned vocalist who has sung with the likes of Bonnie Raitt, B.B. King and Ringo Starr). Now in 2006, Mark's road has led back to his Folk and Bluegrass beginnings. 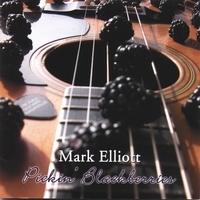 The new CD, “Pickin' Blackberries”, shares 12 new songs with some of the most respected names in acoustic music. Mark's guitar and voice, coupled with the likes of IBMA winner Jim Hurst, National finger-picking champion/John Denver guitarist Pete Huttlinger and Americana divas The McCrary Sisters, make for a strong and genuine delivery of his captivating stories! Music: “Not All Who Wander Are Lost” is a country-gospel track. Mark wrote the tune, sang the lead vocal and handled all the recording and mixing duties. Pete Huttlinger played guitar and Missy Raines (Claire lynch Alumna) played bass. David Spak played provided the percussion and the awesome background vocals were compliments of Ann & Regina McCreary. Recording: Mark has got it all gong on here, folks. Great song and a very fine recording. Aside from some minimal compression sibilance on the lead vocal, this sparse mix delivers the goods. We particularly enjoyed the lack of processing on the vocals. When you sing like the McCreary Sisters, none is required! Mark surrounded himself with talent, and his straight forward recording brings that. Good stuff. Suggestions: Given Mark’s strong vocal delivery, it’s understandable he’d reach for a compressor to help smooth out the vocals. We would suggest that Mark try a more organic approach by “working” the mic rather than relying on the compressor.